CHRs have a long history of serving the Native American community and working on behalf of their tribes and communities. 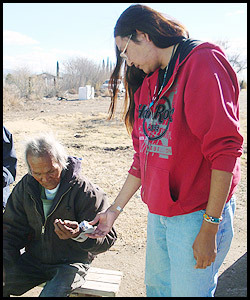 The Southwest Reservation Aid (SWRA) program, formerly the Council of Indian Nations, served the San Carlos Apache tribe in Arizona through 15 different program partners in 2012. Partner organizations range from Community Health Representatives to schools to weight management agencies. In 2012 alone, San Carlos partners received a total of 43 shipments from the Phoenix warehouse. The majority of requests were related to the Healthy Living and the Community Event projects. 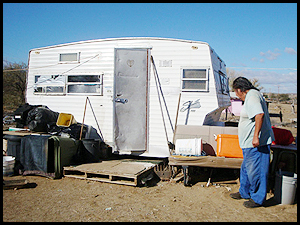 Although the San Carlos Apache Indian Reservation is only located about 90 miles east of Phoenix, the landscape varies between forests/mountainous, desert and plateau areas and traveling there by car or semi-truck typically takes at least two hours. Conducting home visits is a big part of the services provided by the Community Health Representatives (CHRs). CHR’s are paraprofessional health care providers serving as promoters and advocates of health and wellness and are typically enrolled tribal members of the nations they serve. This allows them to be familiar with the unique cultural aspects and language of their patients. Conducting home visits is a big part of the services provided by the Community Health Representatives. This knowledge of not only the culture, but the service area and available resources allows for an open dialogue about health concerns and matching needs with other resources and referrals. CHRs have a long history of serving the Native American community and working on behalf of their tribes and communities. The San Carlos CHR partner used the delivery of Elder holiday stockings from SWRA programming as a means to screen their Elders and provide health education during the holiday home visit. 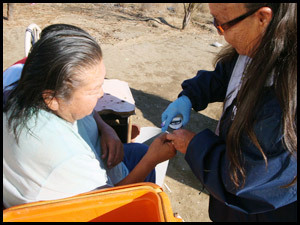 According to the University of Arizona, this tribe “suffers from significant health disparities, including high incidence of obesity and Type 2 diabetes”… education and regular monitoring is key to keeping these Elders healthy. A single job description cannot possibly describe and account for the range of responsibilities CHR’s carry out each day. Besides providing regular home visits to their clients, they are also responsible for providing group opportunities for preventative health care topics, delivering a range of health assessments, monitoring a patient’s condition and providing transportation for clients, as needed. These are just a few of the main functions provided by a CHR. These health care paraprofessionals provide so much more in terms of emotional support to their clients — a support that is built upon trust and consistency between provider and patient. SWRA is fortunate to support the work of these individuals throughout Indian Country.